A South African girl born with the AIDS virus has kept her infection suppressed for more than eight years after stopping anti-HIV medicines — more evidence that early treatment can occasionally cause a long remission that, if it lasts, would be a form of cure. 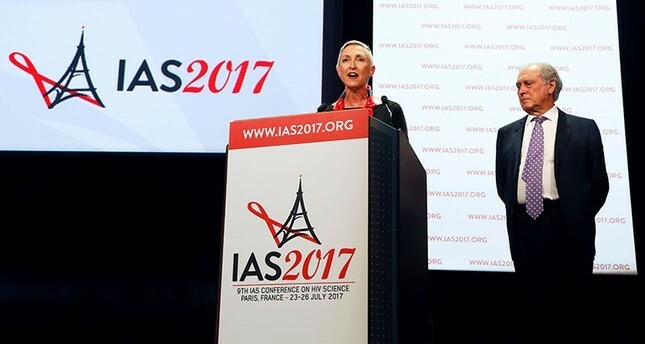 Her case was revealed Monday at an AIDS conference in Paris, where researchers also gave encouraging results from tests of shots every month or two instead of daily pills to treat HIV. "That's very promising" to help people stay on treatment, the U.S.'s top AIDS scientist, Dr. Anthony Fauci, said of the prospects for long-acting drugs. "This new case strengthens our hope that by treating HIV-infected children for a brief period beginning in infancy, we may be able to spare them the burden of life-long therapy," Fauci said. Some scientists refer to sustained, drug-free remission as a "functional cure." Unlike a traditional cure, where the virus is eradicated, the patient still has HIV in their system but it is so weakened that it cannot replicate or spread to sexual partners. Researchers hope that by treating people as soon as possible after infection, they can one day induce drug-free remission for sustained periods of time, perhaps for good. This has become a major focus of research amid fading hopes of finding a permanent cure. The virus has proven sneakier than imagined -- it has the ability to hide out in human cells and play dead for years, only to re-emerge and attack as soon as treatment is stopped. Anti-retroviral (ARV) treatment inhibits the virus, but doesn't kill it, and infected people have to take pills daily for life which are costly and have side-effects. A rare group of infected people -- fewer than 1 percent -- are able naturally to stop the virus replicating. They are known as "elite controllers," but the mechanism by which they keep the virus at bay remains a mystery. The girl does not have "elite controller" DNA, said the study authors. Among people taking virus-suppressing anti-retroviral drugs, only a few have attained drug-free remission. They include 14 adults in a French trial who were able to quit their medication after three years and stayed healthy. A French woman aged 20, treated as a baby, has been healthy for 14 years since stopping her medication -- the longest-known remission. In the United States, the so-called Mississippi Baby was in remission for 27 months after being given ART for the first 18 months of life, but the virus rebounded in a major let-down for researchers. Now there is the South African girl -- the first case of remission in a child enrolled in a trial to test the effectiveness of early treatment, for a limited time. "Relapse is a possibility in any case of remission," underlined study co-leader Avy Violari of the University of the Witwatersrand in Johannesburg. However, "the fact that remission has been for a long period suggests this is likely to be durable," she told AFP. Researchers do not understand how the girl achieved remission when 410 other children in the trial did not. "We can't tell if her immune system would have controlled the virus on its own or if the treatment made a difference," said Sharon Lewin, a professor of medicine at the University of Melbourne. The girl was diagnosed HIV-positive on her 32nd day of life. After 10 months of treatment, levels of HIV in her blood went from "very high" to undetectible. Tests conducted when she was nine-and-a-half years old showed the vaguest trace of virus, unable to replicate, said the team. The girl had healthy levels of key immune cells. Some fear the girl is in a minority of people for whom early treatment is sufficient to induce remission. "Early treatment is good for lots of reasons. Early treatment stops HIV transmission, early treatment means the immune system stays in better shape and early treatment keeps the (virus) reservoirs small," Lewin told AFP. "Early treatment may also increase the chance of remission, but more studies are needed to really prove this." Michael Brady, medical director of the Terrence Higgins Trust, an AIDS charity, said remission was "impressive." "We just need to understand more about why this is and then find ways to apply it to others," he commented on the study. The children in the trial were monitored for rebounding virus levels, and the experts stressed it is not a good idea for people to take themselves off ARV treatment.